COPPER MOUNTAIN, Colo. — December 3, 2015 — Woodward Copper has hired Jeremy Cooper as the new, Brand Manager adding more than a decade of experience in the ski and snowboard industry to the existing staff based at Copper Mountain. Cooper comes to Copper Mountain most recently from Park City Mountain Resort where he served as the terrain park and action sports manager. Instrumental in the development, design and activation of the successful action sports brand 'I Ride Park City', Cooper brings 15 years of expertise in both the action sports and mountain resort worlds. "We are very excited to welcome Jeremy to the team at Copper," said Jesse True, senior vice president, Copper Mountain. "I have no doubt that Jeremy will continue to propel Woodward Copper forward as a leading youth action sports center and camp in North America and build upon what the Copper crew has successfully established." During Cooper's tenure at Park City, he and his team were given the highest honor by Transworld Snowboarding and Freeskier Magazine for being nationally recognized as a top ten terrain park and half-pipe. Cooper also created an industry leading team program for athlete training, many of whom went on to win Olympic and X Games medals. 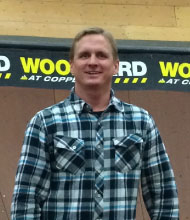 “I am beyond stoked to be a part of the Copper and Woodward family," said Cooper. "I feel grateful to be a part of a company so focused on action sports and dedicated to the growth and progression, specifically, of snow sports." Together with his wife, Jeremy has relocated from Utah to Colorado and will report directly to Jesse True. Woodward Copper is a year-round action sports facility located at Copper Mountain, Colo. offering snowboard, ski, skateboard, BMX, mountain bike, scooter, cheer, and digital media programs as well as week-long summer camps. Exclusive to Woodward Copper is the Barn, a 19,400 square foot indoor playground with Skatelite jumps into foam pits, a pump track, multiple skate areas, a 54' x 22' spring floor, 6 Olympic fly-bed trampolines, and a 16' x 16' Super Trampoline. Combined with nationally ranked terrain parks, Woodward Copper is dedicated to a program of progression that has proven success in athletes of all skill levels.